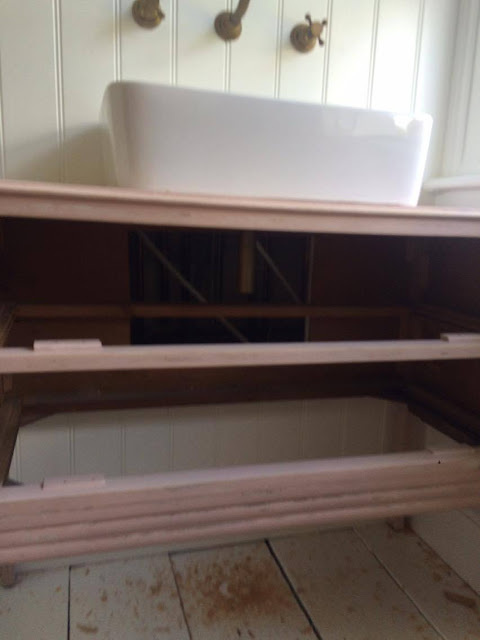 Makeover - Turning a chest of drawers into a bathroom sink unit. We started by searching for a chest of drawers. Our old bathroom, which actually should have been a bedroom for the size of it, spoilt us. In the new house the layout didn't lend itself to a double sink unit so we measured up and searched both via dimensions and proximity to home. Ebay is great but we don't want to be lusting or bidding over something halfway across the country. Alternatively you could look in local antiques or furniture shops. It doesn't have to be pretty to start with, you can work wonders with a paint brush and some new knobs. We found this one for a good price, we paid £45 for it via eBay and thought that we'd repaint it. 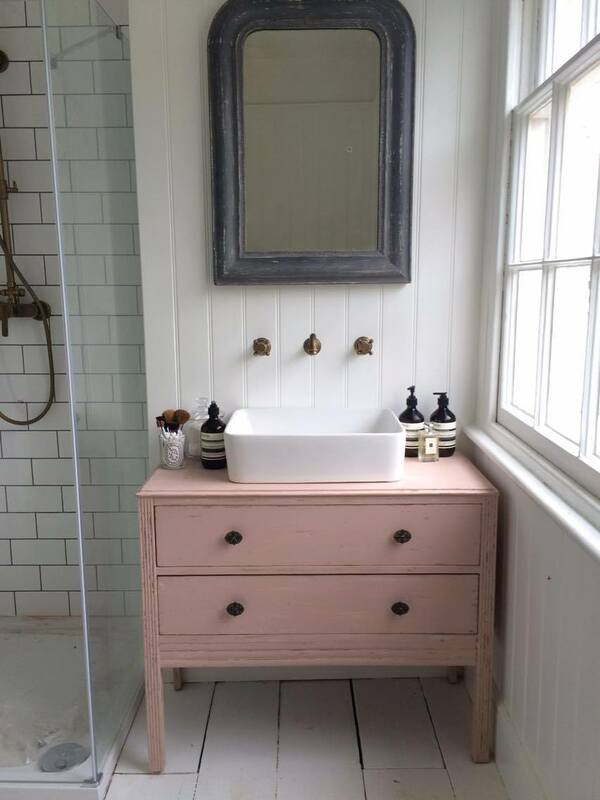 Long story short, we then thought it would be too big for the bathroom so we found another slightly smaller one which was white, but in the end this one being the most perfect pink and a lot nicer in style won the day and miraculously just fits! I thought we'd repaint it, I never thought that we'd have pink in a bathroom. But then it clicked. It was suitably shabby chic-ed already, and pink!! 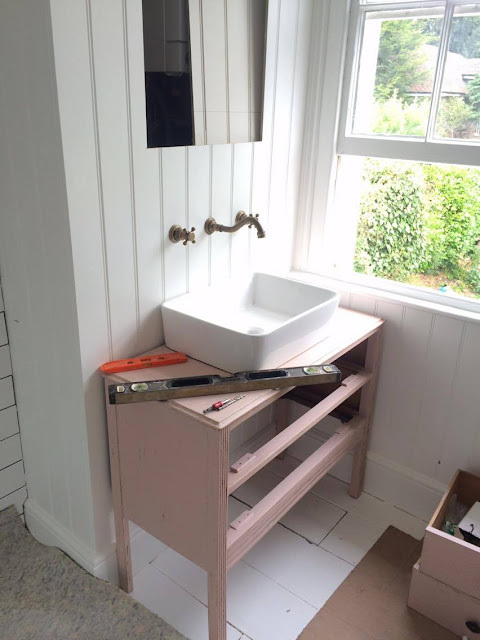 Ben was happy enough to stick with it, so the pink sink unit it was. Which as it happens is v on trend right now. The next step was finding a sink. Again from eBay. This is a baby butler sink without taps, although for our last one we bought sinks with inbuilt taps. We measured up and found a sink that would fit on top. 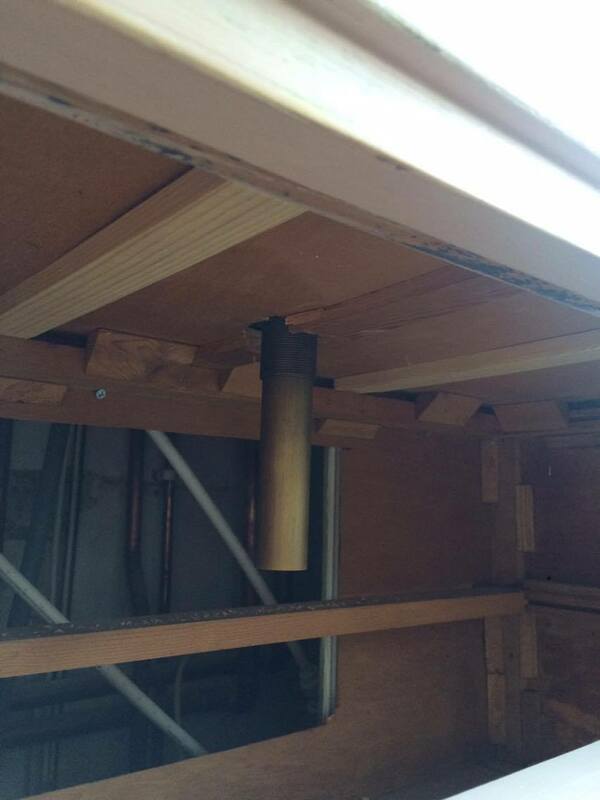 To connect the sink onto the unit, Ben had to cut a hole in the top of the unit for the waste to go through. 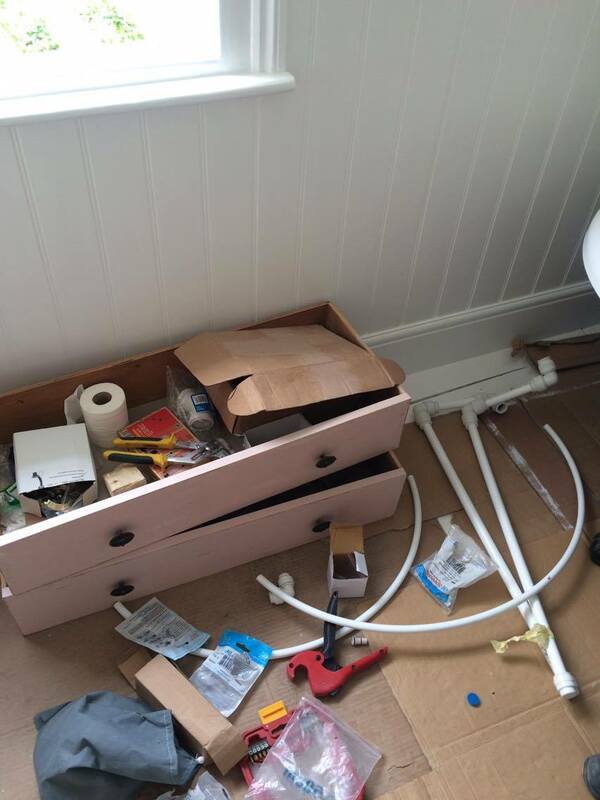 The top drawer then needed to have a cut out to wrap around the waste pipes. So the boys cut the back out and then put a few pieces of wood around it to create a solid barrier. 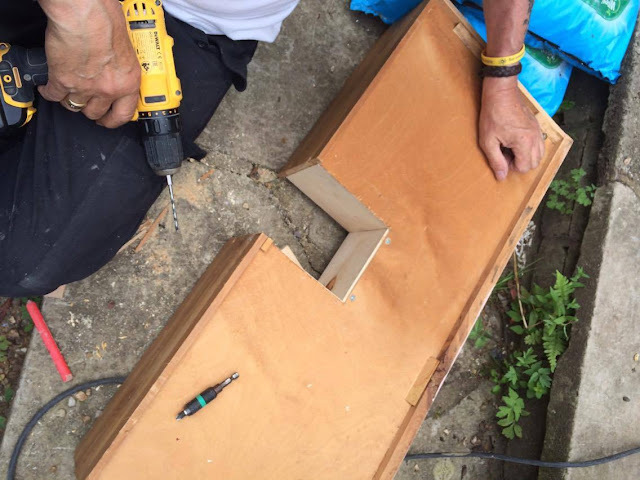 This chest of drawers wasn't the strongest so they reinforced the top and back with pieces of wood inside to make sure it could take the weight of the sink and water to keep it from bowing over time. 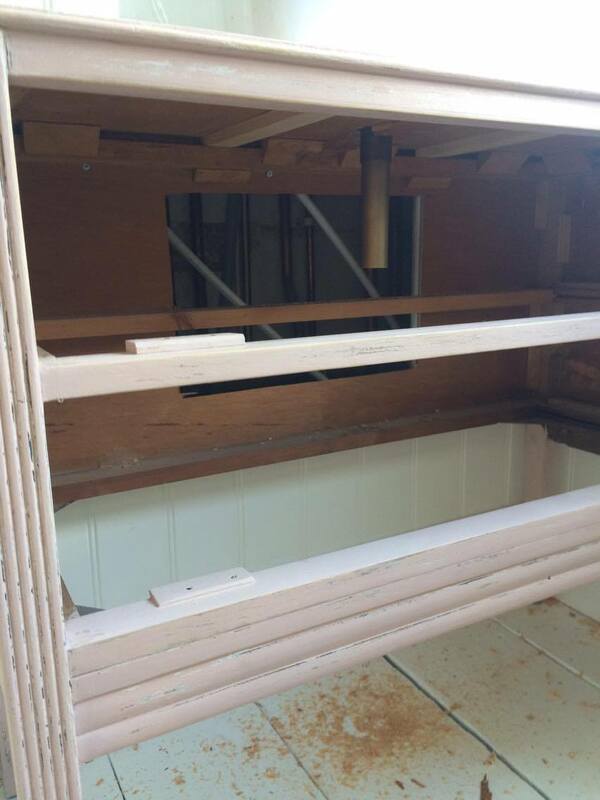 The sink then sits on top, with the waste pipe below, and was siliconed around the bottom edges. 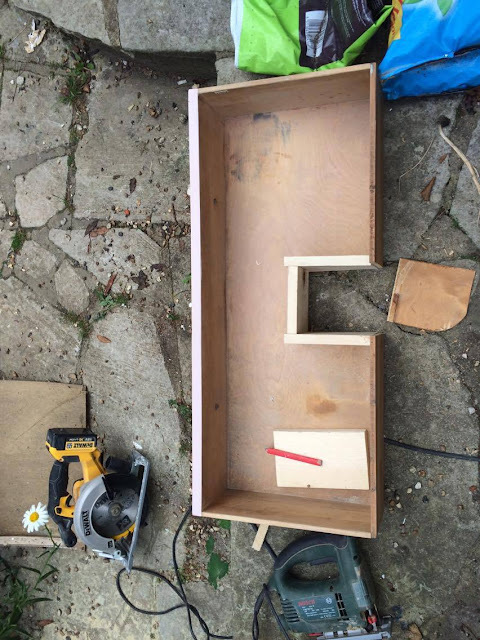 The back of the chest of drawers has been cut out for the waste pipe to connect through to the pipes in the back of the panelling where the boiler and main pipes are housed. The drawers then slide back in and that's pretty much it! I wish I knew what colour the unit was painted in. I think it's some kind of chalk paint. 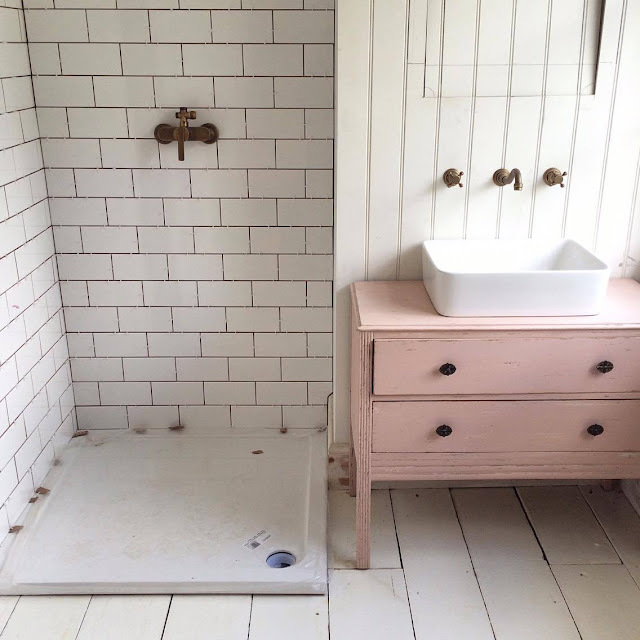 The closest Farrow & Ball is Calamine Pink. It's pretty distressed but I like it that way. I just hope it doesn't get *too* distressed over time. I may have to track down that chalk colour, I'm thinking of messaging the eBay seller I bought from and hoping she'll remember. I may add some wax too. 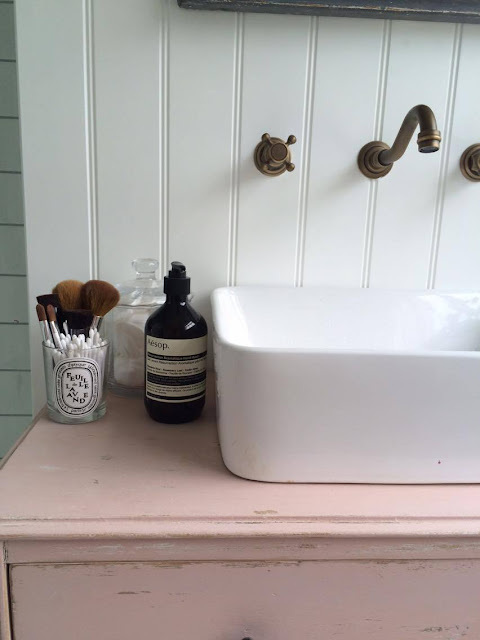 - side note, post on recycling Diptyque jars for bathroom storage here. Aesop toiletries which are my fav are available here. 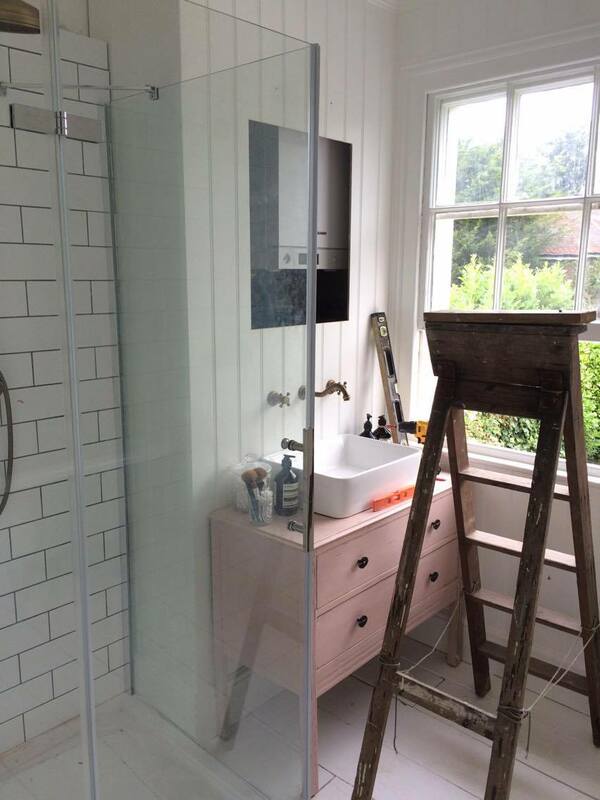 I'll blog the whole bathroom soon, it's almost finished! 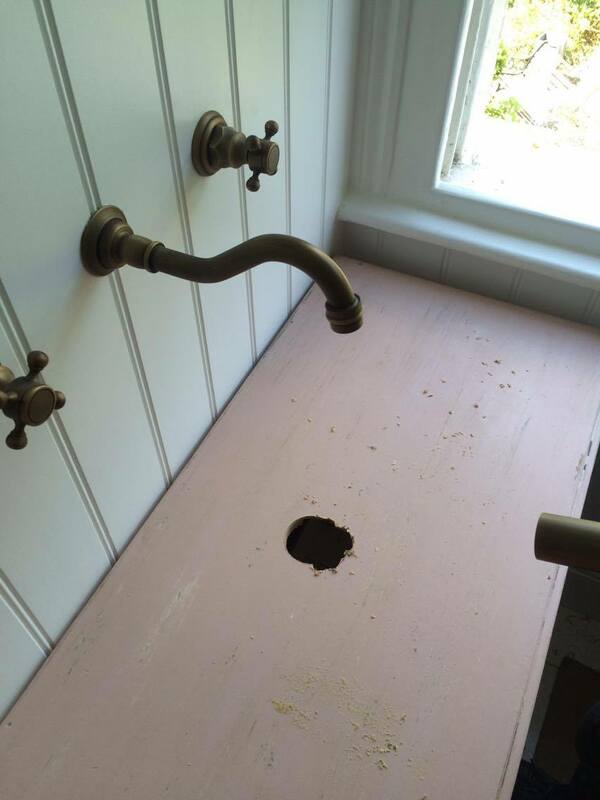 For the taps, another eBay purchase, Ben fitted them through the panelling so that they come out the wall. 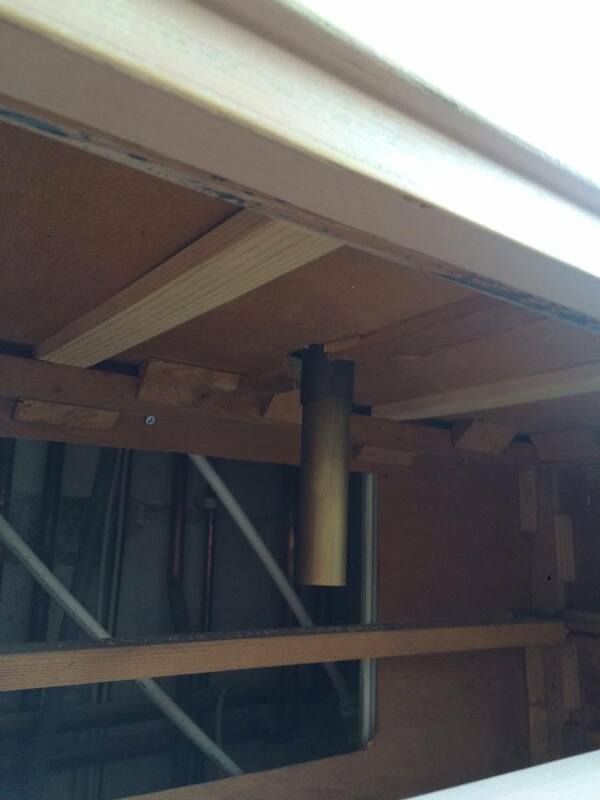 It was made easier by the fact there is a false wall and cupboard to hide the pipes. With a solid wall it would have been a lot harder to chisel out for the pipes to sit in there and plumb it in. When placing the taps we thought about the height both for aesthetics above the sink but also practicality with splashing etc. I'm really pleased with how it's all come together, and what a serendipitous pink find! It's the real focal point of the bathroom and I'm so in love with the pink. Let me know if you have any questions and I'll put them to my DIY guru. Hello,We are looking for the bathroom worktops.Can you suggest which is one best?